Ronan may have believed he was singing about the silence between lovers, but personally I think he was singing about the silence between players online. In most games, a lobby full of “no-mics” leads to a poor game, but this is not the case with Left 4 Dead 2. A game so well designed that it can be played co-operatively in complete silence. Over the past few years I have developed a Friends List full of preferred co-op partners. These are my regular gaming pals; they own the same games as me, have the same attitude and can be genuinely considered friends. Online we talk about everything from the game we are playing, to sports, TV, film and many other things in between. We are not in the habit of shouting racial or sexual insults at one another. I find this sort of discussion is mostly found when playing with the great unwashed of Xbox Live – the 12 year old with the potty mouth, or the racist who would be arrested if he spoke that way in the street. These reprobates multiply when playing competitive games, but can still be found in the co-op arena. These people are a vocal minority ruining the online experience for the many decent people; their annoying nature has led to many players deciding to play without their headphones or microphones. Without communication co-op gaming is far tougher; try creating a coherent building strategy in Red Alert 3 without communication, or figuring out where anyone is in Duke Nukem 3D. Communication is key, but what do you do when communication has broken down? You hire the genius programmers at Valve to create a game that can be played within the Sound of Silence. For a recent experiment, Mad Professor BaPenguin of Co-Optimus Labs tasked us to play co-op with random strangers. This is one step up from the time he asked us all to grow beards as a homage, or the time we were made to create new Co-Optimus T-Shirt designs by only using the content of our bins (my Billy montage made from banana peels and tea-bags won the runner up prize). 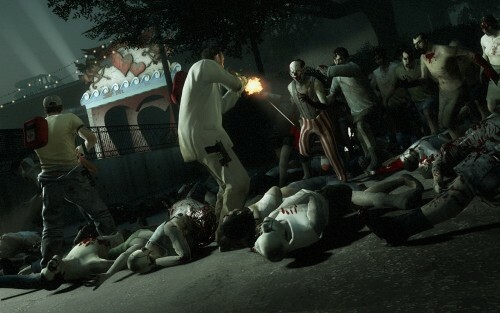 The game I chose was Left 4 Dead 2, possibly the greatest co-op series of this generation.